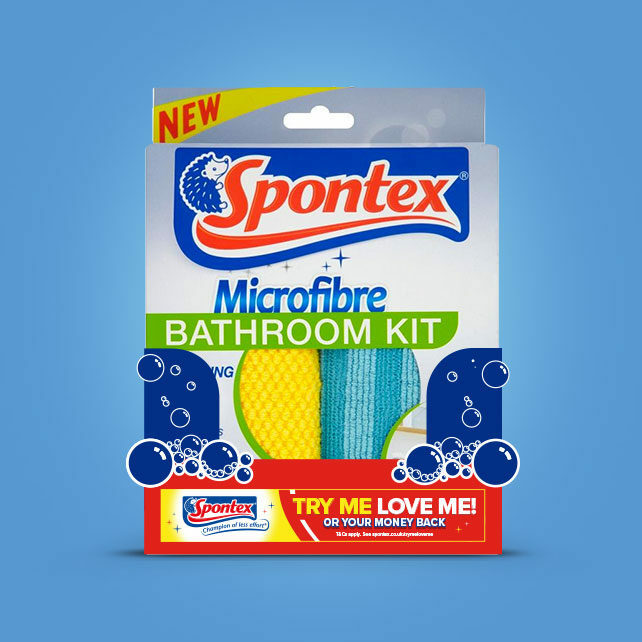 In a highly competitive household cleaning tools market, we were given the challenge of helping Spontex protect and grow their position within the microfibre sector, by driving awareness of the range, and driving trial and conversion in store. 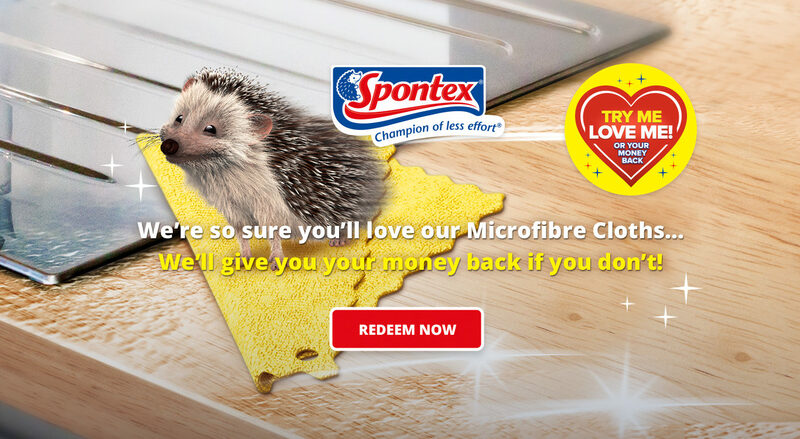 We established that, amongst the cleaning community, microfibre cloths carry an almost hero status compared to other cleaning cloths, and that they have a higher conversion rate from trial to ongoing usage. This determined that driving trial was key, and that trial would lead to repeated usage. Advocacy and word-of-mouth are also key motivators to trial – with our target audience being more likely to trust a recommendation from a friend or family member, rather than advertising. 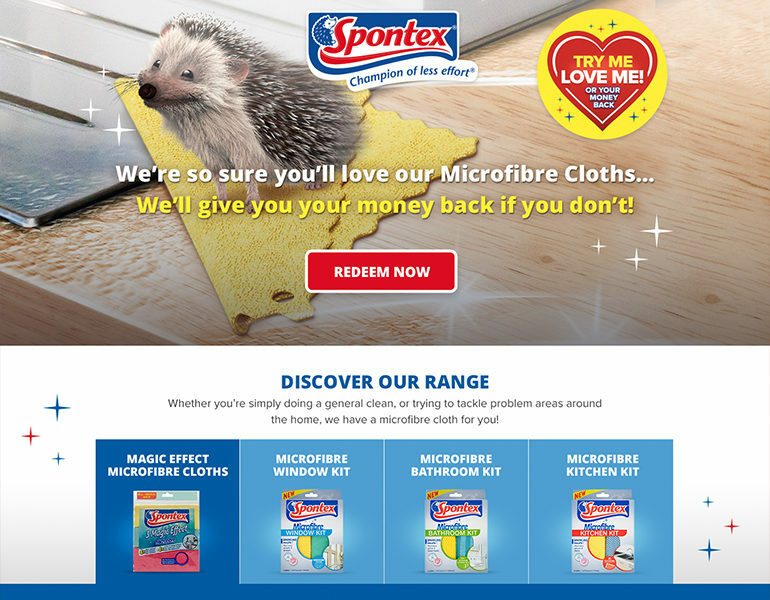 With microfibre already having a hero status, key messaging was identified to sell the functional benefits of ‘better, quicker and easier’ – highlighting that a microfibre cloth is recognised as more efficient and effective, compared to a standard cleaning cloth. Built on these insights, we created a fully integrated ‘Try Me Free’ campaign, supported with both in-store and digital activations. We identified that the typical ‘Try Me Free’ messaging wasn’t a particularly positive or confident message for NPD, so recommended a shift to more positive messaging of ‘Try Me Love Me!’ Using a positive term such as ‘Love Me’, shifts the emphasis to a more positive tone, whilst also amplifying the TRY message. 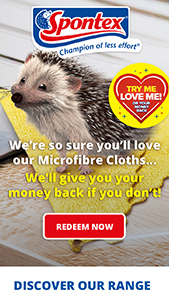 The aim of the campaign was to drive trial of an innovative new type of microfibre NPD, whilst also supporting a wider range of microfibre kits by removing any barriers to purchase and trial, so we developed an on-pack “try me free” mechanic. 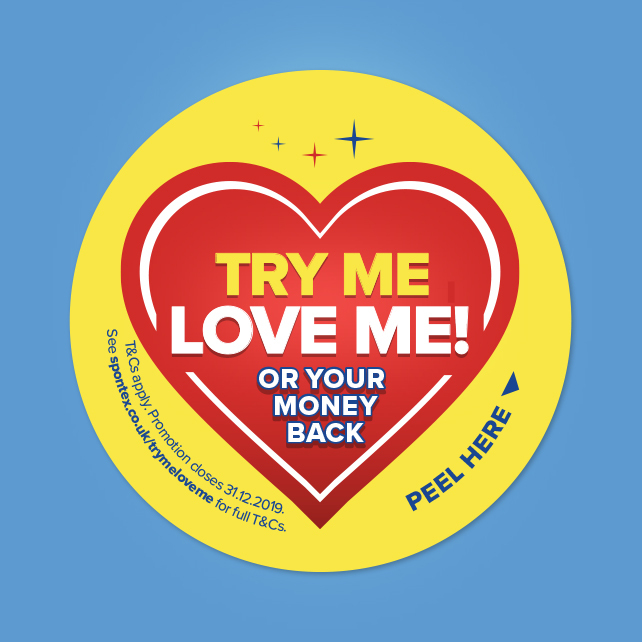 The in-store campaign featured messaging on pack via a ‘Try Me Love Me!’ promotional sticker, which linked back to a dedicated campaign microsite, with redemptions insured by a third-party promotional risk partner. The ‘Try Me Love Me!’ messaging also was also extended to the SRP to drive stand out at the fixture. Using the microsite, consumers could enter a unique code, and upload their purchase receipt to claim their money back if they were not entirely satisfied with their purchase. We identified that this audience was highly active online and on social media, often following cleaning blogs and stories in the news agenda, so we created a digital campaign to reach key audiences in these digital environments. We targeted Female 25-65+ who had an interest in cleaning and home interiors, as well as online shoppers and coupon collectors. 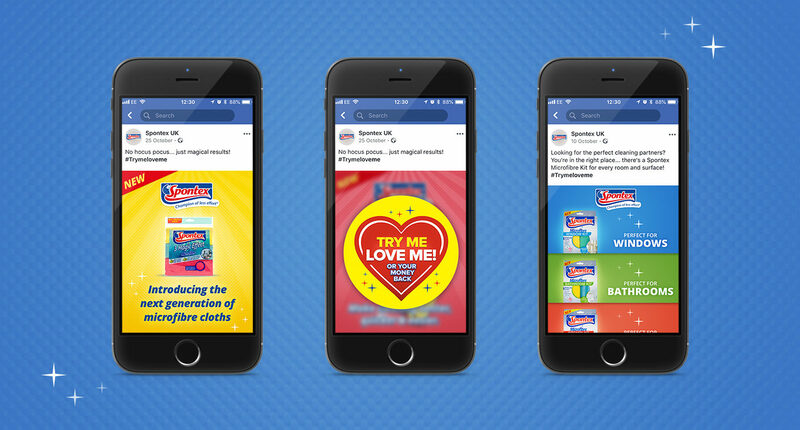 A series of 6 ads were created to amplify the campaign via a high impact social advertising campaign targeting key audiences across Instagram, Facebook and Youtube – with rich, animated brand messages that lead with a product story and ended with the ‘Try Me Love Me!’ activation message. A Youtube campaign using 6-second bumper ads was created to drive reach and awareness of the brand and promotion, giving a bigger screen experience for the brand. 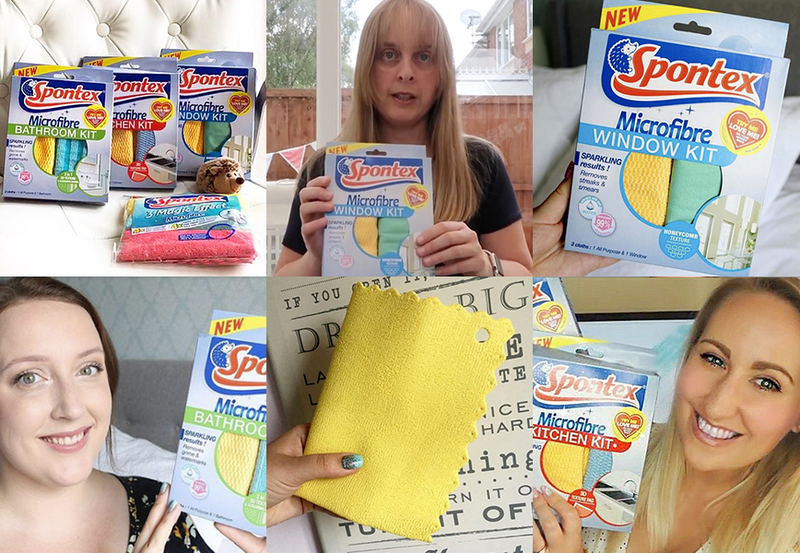 We worked with a number of influencers who have historically shown an interest in cleaning and vlogging. These influencers helped support the promotion through advocacy and word of mouth by sharing a true and honest review of the products on their blogs and social channels. They also were able to network with each other, and other influencers – which caused an influx in submissions to work with the Spontex brand for future promotions. 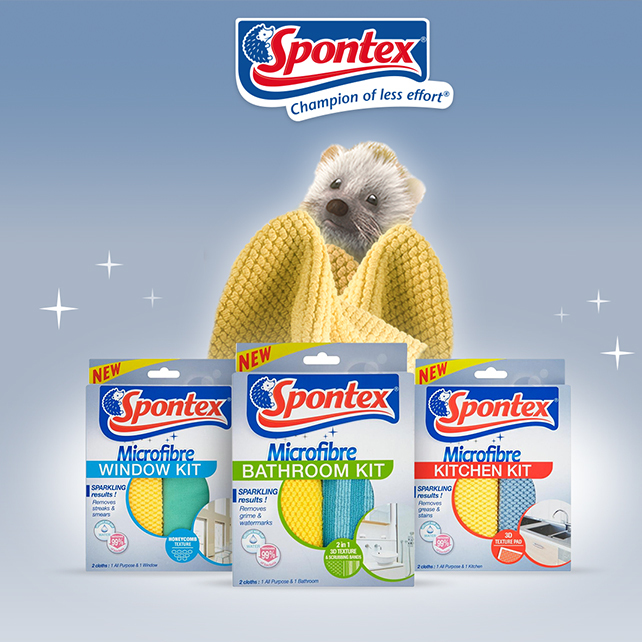 The campaign delivered a 33% increase in value sales over the campaign period, with microfibre kits selling out across multiple retailers. On the back of this success, the campaign has been extended by a further 4 months. The digital amplification campaign delivered 1.9 million ad impressions on Facebook and Instagram, and a further 3 million ad impressions via YouTube. This reached over 1 million viewers, with 3x frequency and an average click through rate of 0.40% suggesting high levels of engagement with the video content.